Close to the city and with Greg Norman's name on it, Thana City Golf & Country Club gets a lot of play everyday of the week despite the owners investing very little capital into course improvements. There is a good mixture of short and long Par 4's and Par 5's and the golf course design is one of the better ones in Thailand. Once home to the Nick Bolliteri Tennis Academy and David Leadbetter Golf Academy, the Master Plan fell short of its vision but the course remains popular with locals and tourists alike. Still, if you're just wanting to play a good golf course without the bells and whistles, then Thana City is worth a visit. 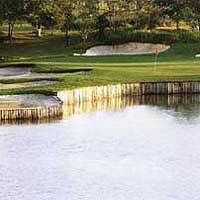 Greg Normans only golf course in Thailand and a good track for all players. Shocking service and very grumpy Assistant Manager, coupled with some of the worst restaurant service you'll find anywhere, but if that doesnt bother you, a good day of GOLF is to be had.